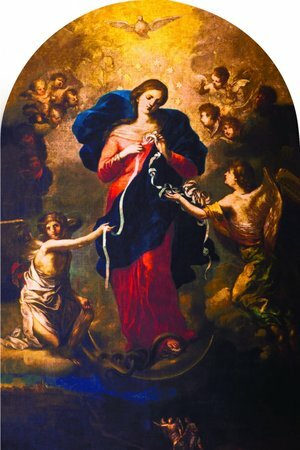 Here’s Day 6 of The Our Lady, Undoer of Knots Novena! We would like to ask for prayers for one of our tenants. Their financial situation is desperate at this time. They are good hard working people and try very hard to meet their bills, but are overwhelmed at this point due to medical bills. For Alfie Evans & all children in Adler Hey Hospital. And for all children being abused in any way worldwide! Holy Mother, I ask you to guard my children from evil and their insecurities. I ask you to keep them close to your Son and untroubled by doubt and fear. Help them know the inner strength only He can give and the care only a living mother can provide. I ask this in Jesus’ name. Amen. Please pray for maverick who has a heart murmur! Gina who has severe nerve pain! Would like to earn extra $$$ as an outside agent from a Travel Consolidator.TY❣️??? Mother Mary, the undoer of knots please pray for me so the Managers can decide and give me a full time Job so I can take care of my Family as a single Mom. please untie this knot of unemployment for good and grant me financial freedom. I trust in your powerful intervession, in the name of Jesus Christ the Lord . Thanks a million in advsnce . Amen ??? Mother Mary, there are several knots within my life. I ask for my health to be restored. I’m fighting breast cancer, hepatitis c, heart issues, and extreme fatigue. Please intervene with your precious son, on my behalf. All thanks be to God! Mary the undoer of knots take over all the knots in my life ,my children’s life, my husband ‘s life and my famalies life. I need you to intercede for us in Jesus’s name I pray Amen. I ask for prayers and blessings for my future husband’s trucking business. That the business may continue to grow and prosper. And he and his drivers have safe travels and open roads. Lord Jesus. I pray for money to finance my son throughout medical school. Mary undoer of knots. Please remove the knots that is blocking the flow of my finances today. I pray for my daughter please mary undoer of knots remove all knots that is blocking hervftom being successful with her exams. Please undo the knots that is leading to nlcbtt. I pray for my husband and my family. Please,pray for my son Maciek. Dear Mother Mary, I give thanks for all I have in my life and all the favours I have received through your powerful intercession. I beg of you that I will get miraculous news about the scan my oncologist is arranging for me to have over the next 8-10 weeks. I know most of the medical people don’t believe in God and the power of prayer – but I live every second of every day in hope, faith and trust that through your powerful intercession, your Son will hear my plea. Eventhough others think this is an impossible situation, I know nothing is impossible to God. I ask this not just for myself, but as a single parent, I especially ask for my three children and my aging mother. Mother Mary I leave everything I am and all I have and all that will be with you. Hear and answer this earnest prayer.